Different types of earth retaining systems can be employed to conduct deep excavation procedure in construction. The selection of earth retaining system depends on the economy, the soil conditions of the site, the safety of adjacent structures, water table conditions and environmental conditions. Types of earth retaining systems used for deep excavation are explained below in this article. This soil retaining arrangement is suitable for deep and less wide soil excavations. 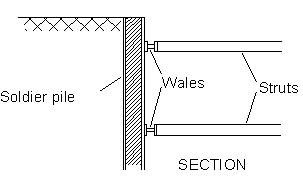 Initially, horizontal members are installed against the soil support. These horizontal members are called as waler. From one waler to the other, intermediate struts are installed across the excavation. H- Shaped Soldier beams are inserted into the soil at a spacing of 6 to 10 feet. The lagging timber is installed behind the front flange in order to retain the soil as the excavation proceeds. The lagging is placed behind the inside flange. The lagging dimension is adjusted so that it perfectly fits between the soldier beams. This method is not suitable for perfectly cohesionless soil. This is efficient in soil with a high water table. Difficulty in driving due to presence of hard layers and boulders. This system is mostly employed in water bearing soil. 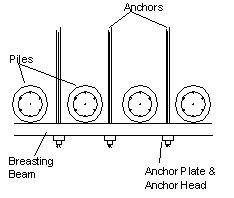 As shown in figure-5, struts or anchors are used between the wale. 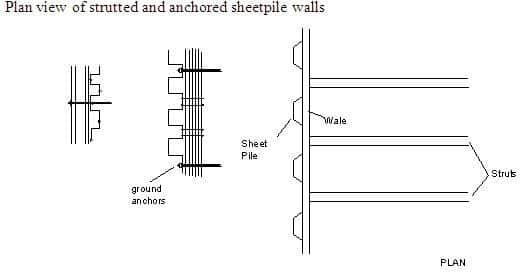 The discontinuities created by the use of sheet piles avoids risk of water tightness. 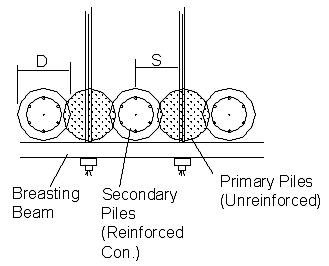 Sheet piles used can be either reinforced concrete or steel made as shown in figure-6. Steel sheet piles are most commonly used type. This type of pile walls are best suitable for cohesive soil. Cohesion in smaller amounts is necessary for the pile wall to be effective. This system does not demand water table. The spacing of intermittet bored pile walls depend on the moments and the soil type. The common pile diameters used are 60 and 80cm. It is found more economical than diaphragm walls for a site where there is no water table. Used when secant piling or diaphragm walling equipment is not available. (i.e. in cases where ground water exists.) Grouting between the piles is common in water bearing soils. Poor workmanship creates significant problems. May be constructed “hard-hard” as well as “soft-hard”, “soft” Low cement content or bentonitic concrete. 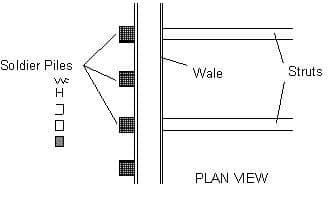 A diaphragm wall construction for deep excavation is a classical method used for major construction works performed under the water table. It is formed and cast in a slurry trench. Bentonite or polymer-based slurries are used to support the trench excavation. These slurry help to prevent soil incursions into the trench excavated. The slurry is then replaced by concrete which forms a structural system called the diaphragm wall. The diaphragm wall constructed can be either temporary excavation support or a part of a permanent structure constructed. The construction sequence is explained in figure -9 below. These earth retaining support provide high structural support and water tightness. 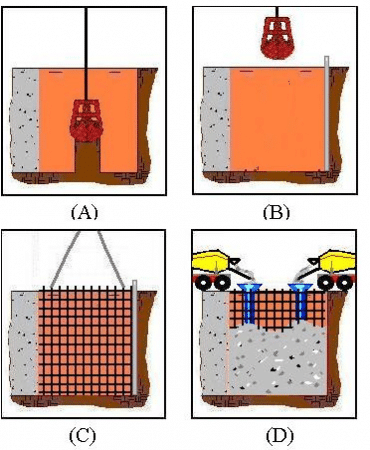 Prefabricated diaphragm wall construction uses the same principle as the above method with bentonite-cement suspension in the trenches. The prefabricated panels are placed inside the trench and the slurry mixture is set. The panels are excavated to the depth required for tightness, while the prefabricated elements are placed only to the depth required for ground retaining. 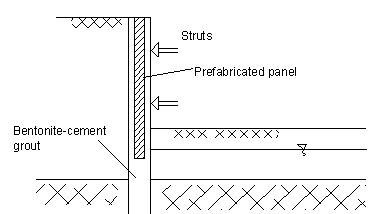 Concrete prefabricated panels may be designed quite thin by the use of good quality concreting and reinforcement. These may allow cheaper alternative projects than conventional diaphragm walls. Sheet piles or prefabricated steel slabs can also be used as alternatives for reinforced concrete panels. For small heights with no or small water pressures bentonite-cement grout (c/w ratio 0.1-0.4) reinforced by steel mesh and vertical steel sections proved to be practical. The reinforced concrete retaining walls for deep excavation activities can be either cast in-situ or prefabricated ones. The excavation process is performed in stages. The method is best suitable for soil with some cohesion. It is effective in soils with no water table. These systems in some situation ask for mini pile support.